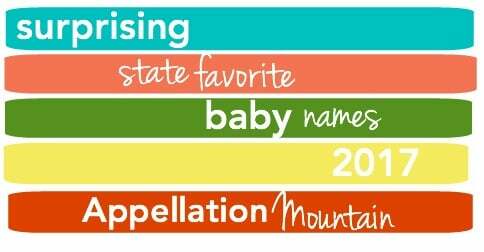 Yesterday, I went looking for unusual baby names in the state Top 100s, and unearthed 100 surprising state favorites. Let me explain: the US Social Security Administration publishes a Top 1,000 for the country, but also Top 100s for every state, as well as the District of Columbia. At first glance, the lists look just like the national data, only shuffled. Wyatt and Aurora place a little bit higher here or there, but they remain Top 100 names pretty much throughout the nation. Look deeper, though, and you’ll find some curiosities. 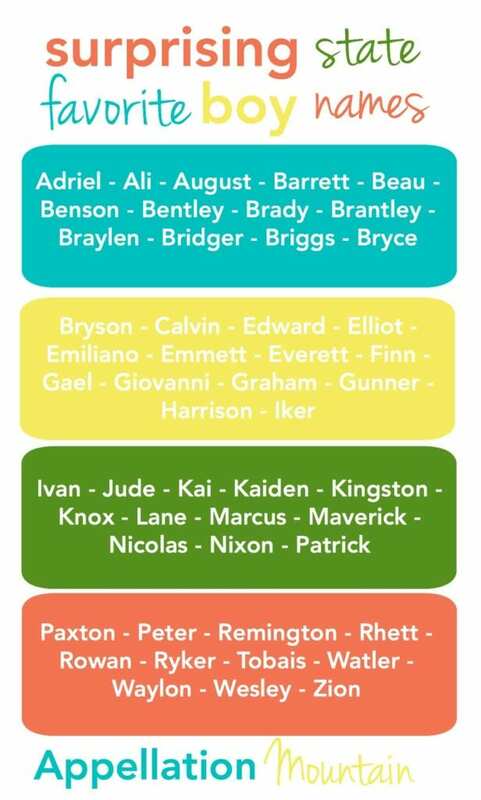 Some will argue that these fail an unusual baby names test, and that’s (mostly) true. Laura and Edward and Bryce all feel perfectly mainstream. But they’re more popular – sometimes dramatically more popular – in some parts of the country. 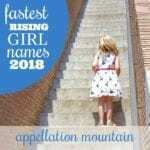 Many more names could make this list, and I followed no formal process to choose these 100 surprising state favorites. They’re just the names that caught my eye as I scanned the lists. The state following each name indicates the first place I spotted the name – not the only state where it makes the Top 100 list. Like I said, no formal process here – just some fun #namespotting. The take-away? Checking popularity lists for your state can reveal surprising trends. Gracelynn and Gunner seem like very different, distinctive choices – but head to West Virginia, and you’ll probably meet more than one. 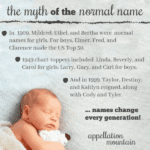 Surname names dominate the surprising state favorites boys’ list, but they’re not alone. Romance language finds, retro revivals (hello, Walter and Calvin! ), and modern discoveries (Iker, Kai, and Kingston) all mix on this list. Some, like Everett, Beau, Maverick feel like they’re headed for the national Top 100 given a few more years. Others seem harder to imagine catching on across the US. As on the boys’ list, the surprising state favorites for girls range from the old school to the completely novel. 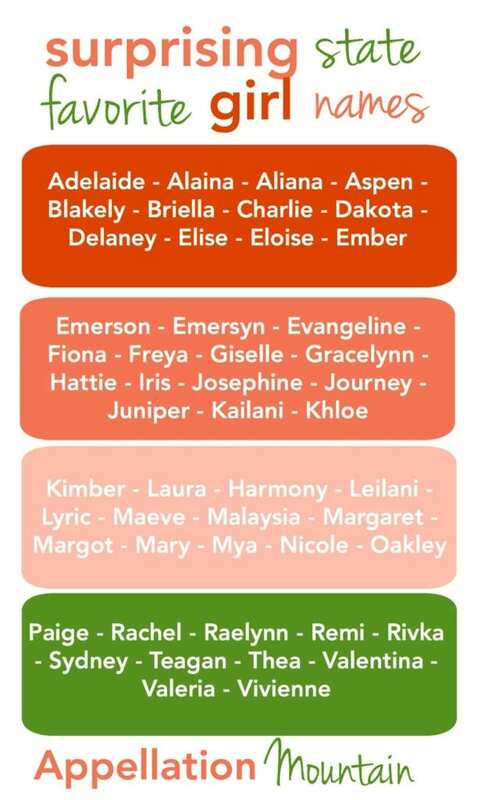 I’m a sucker for Hattie and Adelaide, but it’s interesting to discover musical names like Lyric and Harmony on these lists, too. Some of these names seem quite close to each other. Emerson and Emersyn make state Top 100s. Is it the next Madison or Mackenzie? 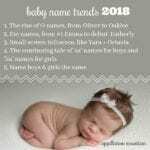 And Alaina and Aliana make the list, more examples of flowing names for girls that sound traditionally feminine, but often came into use relatively recently. Any of these surprising state favorites on your personal lists? Do the names near the top of the charts in your hometown sound familiar? I’d be curious which state best “predicts” future nationwide trends. 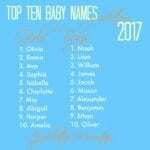 For example, does the fact that Massachusetts parents are naming their babies Calvin and Maeve have a greater impact on whether, when, and how swiftly those names climb the nationwide popularity charts, then if, say, those names were on the Minnesota list? And is there one state or one region that continually sets the trends over time? I look at Washington. It’s granola like Oregon, west-coast-trendy like California, has a lot of pockets of Hispanic populations, exceptional Asian communities, Nordic ancestry, big city Seattle, AND rural eastern side that mimics the Midwest. Hmm.. It looks like Washington is missing from the boys list! Hawai’i is repeated, so either Kai or Zion might’ve been the boy pick from WA? Does anyone else have favorite states to watch? I like to watch Minnesota and Colorado because they tend to be ahead of national trends. Pennsylvania is great because it is a mix of rural and urban areas so popular names there usually have mass appeal. Then it’s also fun to look at urban states like New York and New Jersey and see how different those top 100s are from Wyoming, Oklahoma, Montana, and Idaho. Texas and California are good bellwethers for the national trends and give some hints at what names are big in the Hispanic community and may have broad appeal. Just saw your comment. My curiosity about predictor (or “indicator” or, as you say, “bellwhether”) states was piqued as well.